Taking to social media, producers Haarika & Hassine Creations made the official announcement today on social media. That Jr NTR and Trivikram Srinivas are teaming up for the first time is something that we all are aware of. The film has created quite an excitement amongst Telugu movie-buffs for obvious reasons. Much is being speculated about who would be playing the leading lady in the film and a lot of top actresses’ names like Shraddha Kapoor and Pooja Hegde were doing rounds. The makers have now made an official announcement and cleared all the air around this aspect of the film. 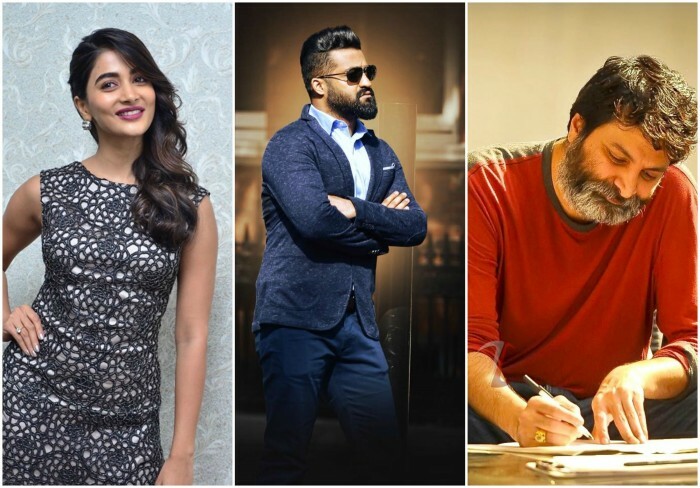 Pooja Hegde has been roped in as the leading lady opposite Jr NTR in the film to be written and directed by Trivikram Srinivas. Taking to social media, producers Haarika & Hassine Creations made the official announcement today on social media. “It is our absolute pleasure to welcome aboard @hegdepooja as female lead opposite our young tiger #NTR @tarak9999. @MusicThaman will be scoring scintillating tunes for #PSVinod ‘s meticulous visuals. Shoot will commence from april, 2018,” a message on the Twitter handle of Haarika & Hassine Creations read. As confirmed by the producers, the shooting of the film would commence from April and the makers are looking to release it in mid-year. It is our absolute pleasure to welcome aboard @hegdepooja as female lead opposite our young tiger #NTR @tarak9999. @MusicThaman will be scoring scintillating tunes for #PSVinod 's meticulous visuals. Shoot will commence from april, 2018. The film was supposed to have music composed by Anirudh Ravichander, however, latest reports revealed that the young music composer may not be composing the songs. The makers have brough Thaman SS onboard for this film and the reason for change is not known yet. Anirudh had composed the music album for Trivikram’s last film with Pawan Kalyan, Agnyaathavaasi, which was a disaster at the box office. The film was launched in November last year and will soon go on shooting floors. NTR took a break after his previous release, Jai Lava Kusa, to shed some weight and look fitter and leaner look for his upcoming film. NTR has hired a trainer, Steven Lloyds, and has taken up a special regimen to get into the shape for his role. A photo of Jr NTR is doing rounds on social media in which he looks super fit and refreshingly leaner. Tarak seems to have shed a lot of weight and looks leaner, which is going to be his look in Trivikram’s film, and fans of the Young Tiger are loving the new look. The film is yet to be titled and will have a lot of veteran actors as part of the cast.